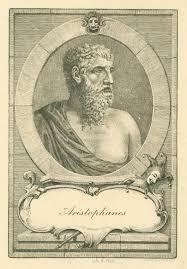 Aristophanes was one of the greatest Greek playwrights and poets of his time. 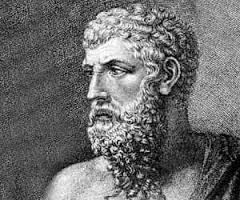 His most notable skill was probably to be found in some of his comic plays which contained often satirical, and sometimes cruel, barbed comments about Greek society in general and some of the most well-known figures within it. 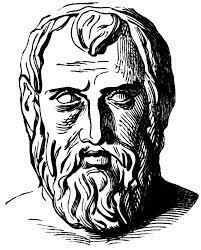 A startling example was found in a play called The Clouds which contained, according to Plato, outright slander that [he suggested] contributed to the trial and subsequent execution of the great philosopher Socrates. As one would expect there is very little to be read about the life of this man although his work could be a source of information about his life. 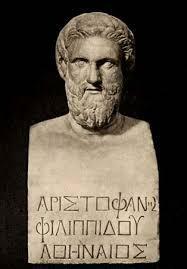 He wrote plays that are generally known as “Old Comedy” and one feature of this type of production was for the Chorus to make an address known as the parabasis which, in effect was Aristophanes himself speaking and giving some insight into his own life. 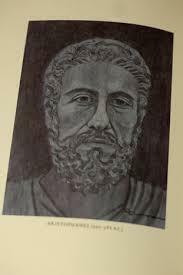 It is believed that he was born in Athens in the year 446 BC, the son of Phillipus. He probably began to write around the age of 19 and soon began to make a name for himself with his dramatic verse, eventually writing some thirty plays. Eleven of these have survived and were performed long after his death. 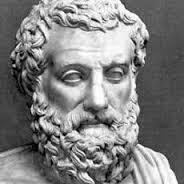 Poets during his time were generally regarded as teachers (the Greek word being didaskalos) and he fulfilled that role to some degree. His plays were certainly written to shock as well as to inform audiences about current and significant issues of the day. He probably thought he was being clever and original but, in truth, he was very much a conservative in his views of society, often openly resisting change. 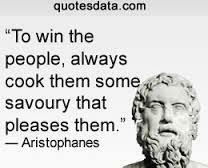 He often criticised new innovations in Athenian society and was savage in his caricatures of political, religious and literary figures. Despite this though he is known as the “Father of Comedy” or the “Prince of Ancient Comedy”. 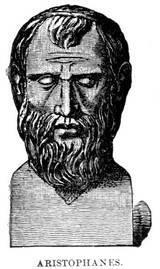 It is certainly possible to get a good flavour of general life in ancient Athens just by reading his work. While his plays may be easier to digest, his poetry is less straightforward. He was a virtuoso who adopted three different poetic forms and it is necessary to recognise each form to get a full understanding of his poetry. The first of these forms is known as “iambic dialogue”. The others are “tetrameter verse” and “lyrics” and all were written in the “Attic dialect”. He used this kind of compound, or made up, word often in his plays. 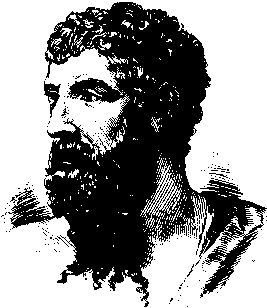 Aristophanes died in Delphi around the year 386 BC, which would have made him 60 years old.